How can your brand stand out in what can be an already crowded market in your category? In store displays get front and centre attention and are a major tactile opportunity for selling. Displays get your product off the shelves and into an aisle, near product category or in a high traffic area at the end of an aisle. You and I know your brand is great, but how do we get your target market to notice it? And then how do we get them excited about making an immediate purchase? How can your brand stand out in what can be an already crowded market in your category? In store displays get front and centre attention and are a major tactile opportunity for selling. Displays get your product off the shelves and into an aisle, near product category or in a high traffic area at the end of an aisle. In fact they can even occupy a store’s entrance with first dibs on shoppers’ attention. But how do you know which display makes the most sense for your marketing strategy? How do we get your products to spring dive right into shoppers’ carts? 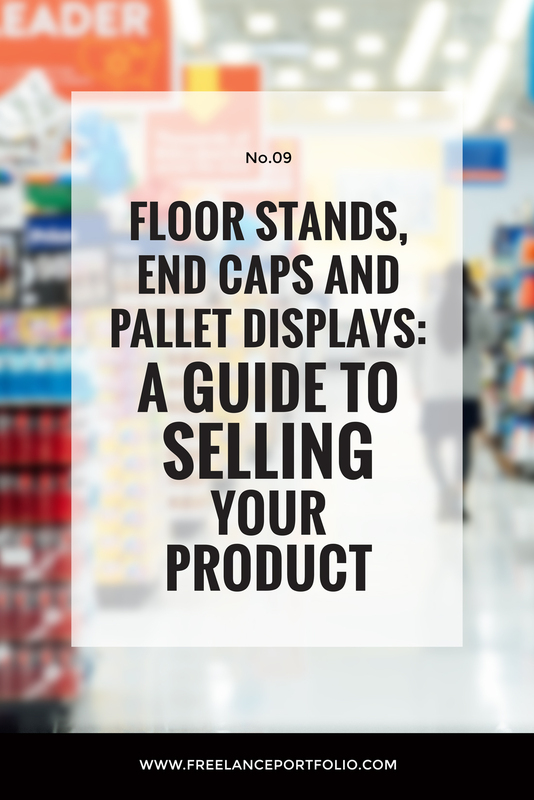 This guide is meant as a tour — to show you examples of displays appropriate for product size and category and how different display styles can capture your target market’s purchase consideration. Pictured here, a showcase of some displays by The Freelance Portfolio. The best place to start is to consider questions like these to narrow your focus down to relevant options. Q.1. Which store(s) are these displays going into? Each store has a set of specifications they will allow for POS materials, and allowable display areas within the store. Depending on the agreement you’ve made with the store, your display needs to meet the specifications they set out in terms of footprint, height and floor or shelf placement. Q.2. What is the size and weight of my product? Size and weight of your product are necessary for determining maximum display yield (how many items can fit in a display) and structural size and strength of your display. Q.3. Will I sell it individually or as a multi-pack? Do you want consumers to buy one item at a time? Or do you want to promote via a trial pack? Q.4. How can I further incentivize purchase? Do you want to run your displays as part of a bigger marketing campaign? Do you want to add a contest? Add a coupon? How about a Gift With Purchase? It is essential to start by framing your goals and your budget and review it together with your marketing team. Outsourcing your displays and promotional work to a team like The Freelance Portfolio will offer you experienced insight with concept, structural and graphic design right through to display production. They can even pre-pack and distribute your displays with their co-packing division, Repack Canada. The Freelance Portfolio specializes in custom design, disposable corrugate displays, focussing on keeping it green by reducing material usage as much as possible for recycling. Corrugate displays are our focus in this blog post and the possibilities are vast. 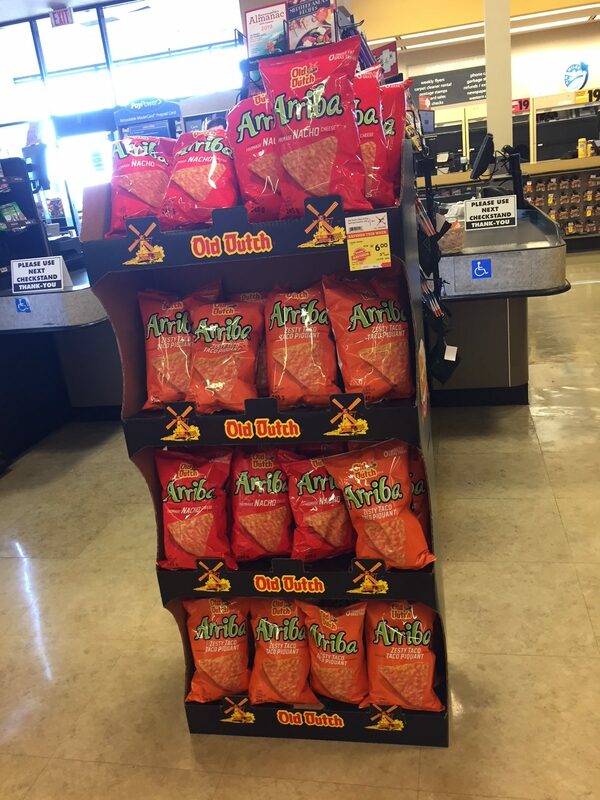 So what do these displays look like in a grocery store and how are they used? I decided to have some fun by touring through some stores to guide you through a few examples of what can be done to promote your your brand and your sales. To note: All photos below are actual POS displays in grocery stores and meant as anecdotal examples only. 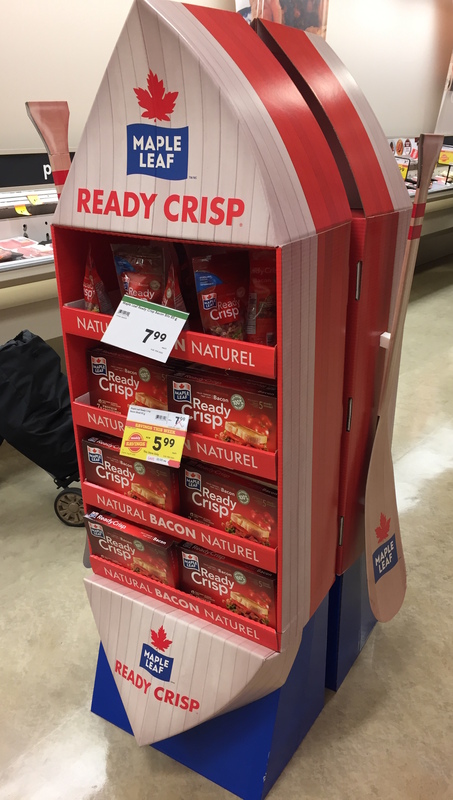 This bacon brand has taken the floor stand to a new level in terms of shape; this is not your average rectangular display! What do canoes have in common with bacon? I think they are going with a Canadian summer theme and this back-to-back floor stand had me looking! The canoe paddles are a playful detail. A popular chip brand gets some prime real estate in this store for impulse buying at the cash register. This end cap is simply designed with 4 shelves. There is no message other than branding because the placement is already crying out “You’re almost at the register — just give into your craving now!” The dark flood coating capitalizes on contrasting black shelves against the red and yellow logo and bright bag colours. Another prime floor space is at the end of an aisle and a reliable dump bin can do the trick as well. We don’t need to calculate strength of corrugate support to hold up the shelves and so this display style can be particularly good for heavier and for irregular shaped goods. 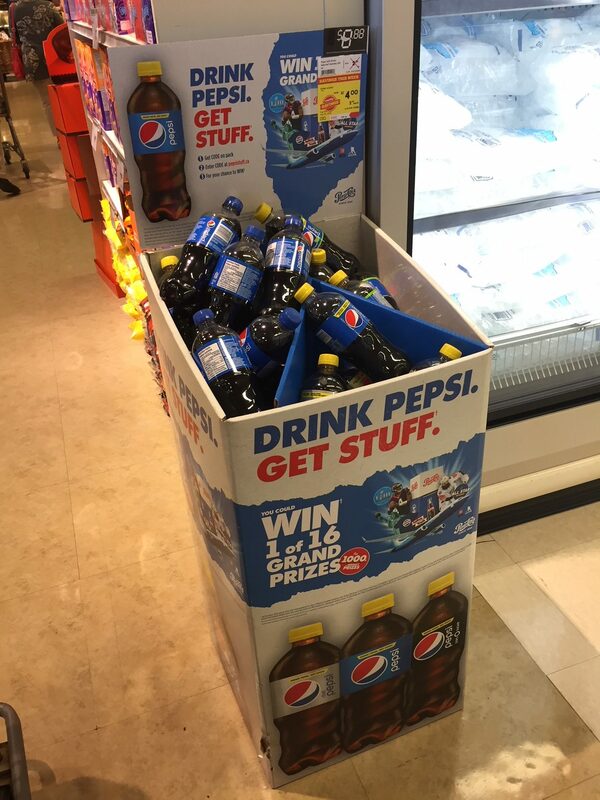 Note how this soft drink’s “dump bin” style display can hold lots of heavy product. All graphic real estate is screaming calls to action in the header with words like “Drink” and “Get” and “Win”. The design and the copy boldly invite the shopper to become a winner as contests are a strong motivator to purchase. Who says you can’t combine display styles? Check out this special back-to-school design with front and centre placement of the shopping space. 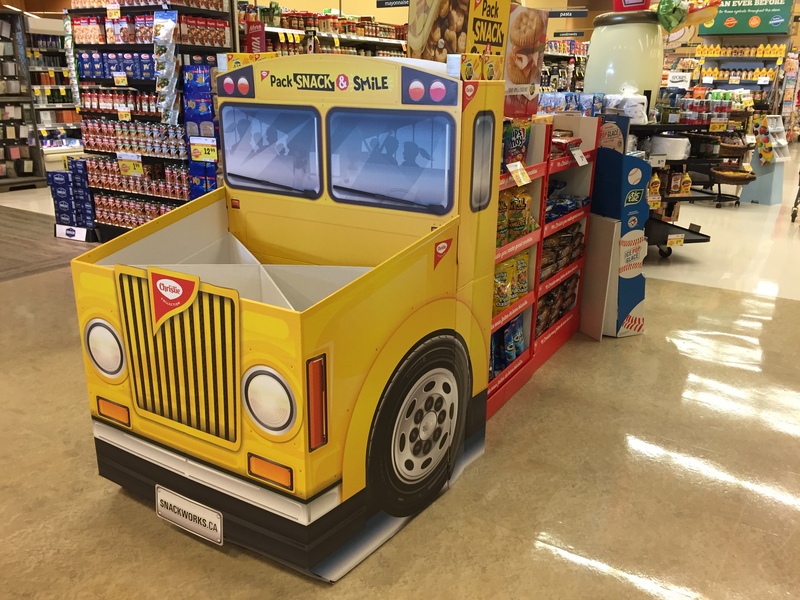 Using a bright yellow school bus theme, the large display holds multiple SKUs of cookies, utilizing a large dump bin style for the front of the bus and four shelf floor stands as the body — what a high yield display! The copy brings the whole theme together with a catchy phrase and value-add of product-related recipes to be found online. You can’t miss seeing this display or feeling an attraction to the fun vibes surrounding it. These two floor stands are a study in contrasts — both in structural and graphic style. The scouring pads on the left are contained within a plain, unprinted tray with pegs on a plain white base. But the header is loaded with colour and tons of copy. The cat food display, on the other hand, is flood coated one colour, with a large logo branding the header and a selling message whittled down to one line of copy. Which display is more effective at communicating its message? Or do their selling styles suit their contents? I’ll let you be the judge! These are just five display samples among endless variations. How do you want to move your product off the shelf? There truly are many factors to consider and when you’re committing to the production of hundreds of displays, you want them to be structurally sound with graphic content and copy to induce shopping desire. I highly recommend you outsource professional POS display design and production services to our expert team at The Freelance Portfolio. We have been designing and producing corrugate store displays for decades and have your brand’s best interests at heart. Contact our friendly team today!